You've treated me well over the past eight years. I've loved you well and washed you little. I'm sorry. You've never broken down on me in 218,000 km. You may have hit three kangaroos on separate occasions and left me stranded with a rather stoved in front half in the middle of nowhere at about 8pm one night but it wasn't your fault you were a roo magnet. Note to self, when you hit a kangaroo and notice that your car temperature level is increasing dramatically, make sure you take note of approximately where you are so that when you call friends to come and rescue you and they ask that all important question, your answer is not a high pitched "On the side of the road next to a really big tree." So helpful. And hello new (to me) shiny sporty car! Happily, mine and MR's idea of a good car for me matched up perfectly, right down to the colour. Working three days a week does not create a budget allowing for sports car purchases so we bought it together. Our first joint big joint purchase/loan! It's been a bit of an exciting week hooning driving this baby around. 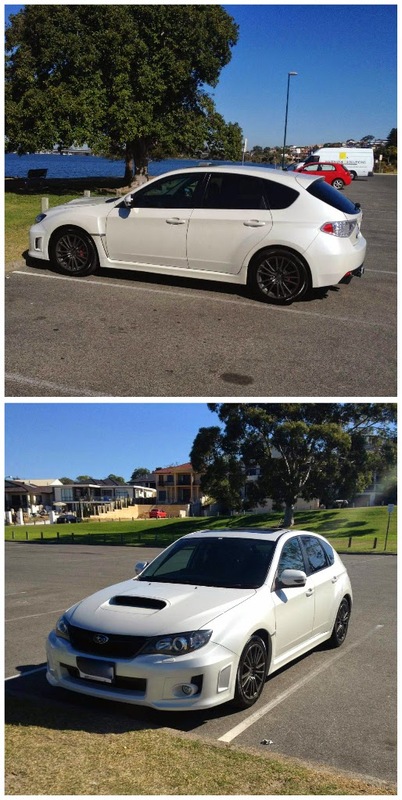 It's a 2011 Subaru WRX. It has leather seats and sat nav and cruise control and bluetooth phone hands free things. I thought the air con was on crack because it kept stopping being cold but MR informs me it is actually just rather clever and has climate control so when it thinks the car has reached that temperature it stops cooling it. Oh, goodbye faithful old care. (was it really green?? or is it just the photo) Your new car is very swish!! Conngrats on your first couple purchase, and I am very impressed with the intelligent air-con!! Happy roo free driving.